Two-division UFC champion Georges St-Pierre has announced his retirement. 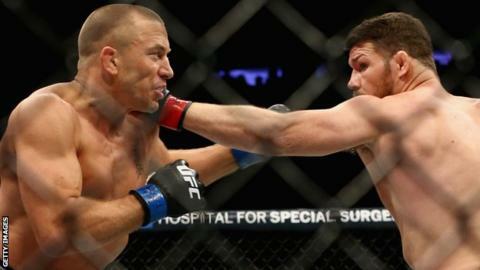 The 37-year-old Canadian returned from a four-year absence to beat Britain's Michael Bisping for the middleweight title in November 2017. He is one of only six UFC fighters to have held titles in multiple weight classes having also been welterweight champion for 2,204 days. "In combat sport that's how you should retire - on top," said St-Pierre, who won 26 of his 28 fights from 2002-17. St-Pierre retires holding several UFC records. He tops the UFC lists in three categories - passes, strikes and takedowns, and his 13 wins in title bouts is the most of any fighter. His combined reign of 2,237 days as champion [2,204 welterweight, 33 middleweight] is second only to Anderson Silva's 2,457 days as middleweight champion. His victory over Bisping in 2017 made him the fourth man to become a multiple-weight champion, joining Conor McGregor, BJ Penn and Randy Couture, with Daniel Cormier subsequently becoming a fifth male multi-weight champion and Amanda Nunes the first woman to join the list. St-Pierre first retired following a record ninth consecutive title defence in 2013 and lost only twice - to Matt Hughes in 2004 and Matt Serra in 2007. He won his final 13 contests. "The career of an athlete is not a straight line and it's important right now and to this day that I remember the positives of everything," he said. "When I was young, the reason that I started mixed martial arts is that I watched Royce Gracie growing up when he won the first UFC and at that particular moment I knew exactly that's what I wanted to do. "It's like I had a vision and I want to thank Royce Gracie to have inspired me." Asked about his retirement, he added: "There's no tears, I'm very happy to do it. It takes a lot of discipline though to retire on top. "It was a long process in my mind but it's time to do it. Only a few people have done it and I always said I wanted to retire on my own and not be told to retire."